Lacrosse is more than just a sport, it’s a game that transforms boys into men…a brotherhood. The 18 boys passing the ball around at a Mission Viejo park today are evidence of that brotherhood. Music, laughter, and childhood nicknames like Moose, Gibby, JMo and TPayne echo off the trees surrounding the field. The team is The Garden Gnomes; a group of rising seniors who played youth lacrosse together. They are reuniting to play one last time as a team at the Tribz Lacrosse Showcase before their senior year of high school. For the past 3 years, these boys have competed with and against each other in their high school stadiums. Their names highlighted in countless MaxLax articles. The lacrosse community knows their names: Buchman, Cheng, Ury, Kauo but they don’t know the history of what brought these athletes together in the first place. In 2007, Jim Gerbershagen started coaching his son Gavin’s 2nd-grade lacrosse team for Socal Lacrosse based in Rancho Santa Margarita. After seeing how much Gavin loved the game, he decided it would be great to build a team of talented youth lacrosse athletes that could consistently play together through middle school. Jim Gerbershagen invited boys from the Storm program to join Gavin, Marcus Huerta, Quentin Buchman, and Jason Moreta on his Socal team. Matt Blethen, Kelly Petro, Sean Toohey, Colby Fojas, and Justin Burk signed up. As other teams disbanded, additional players joined the team: Jason Kauo, Tyler Payne, Cody Harrison, Ryan Harrington. With each passing lacrosse season, Jim continued to invite players with talent to join the team. “There were other guys that came and went, but It was this core group of boys who were the heart of the team,” Gerbashagen recalls. The boys improved, perfected their skills, won games and championships. 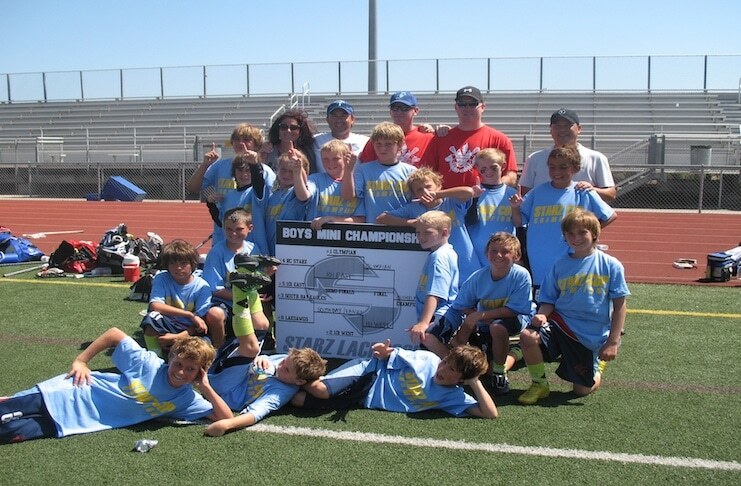 In 2011, when the boys reached middle school, Jim realized that the group’s talent had surpassed his lacrosse knowledge so he teamed up with then Trabuco Hills High School head coach Brendan Finnerty. Coach Finn became their SoCal Lacrosse coach. 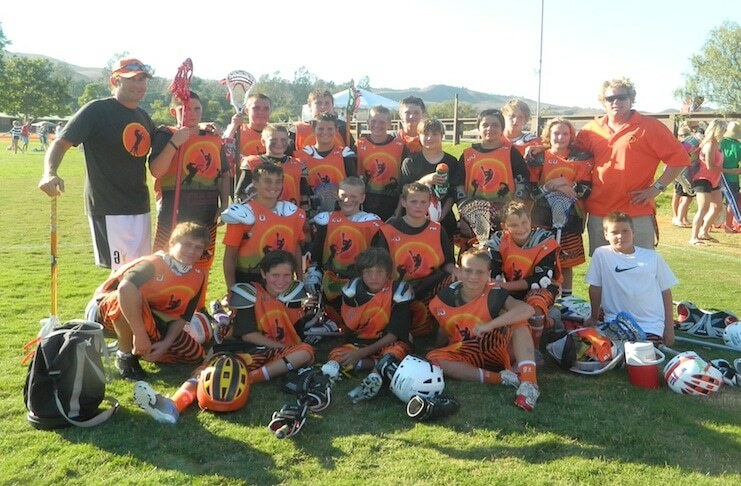 The boys played for the inaugural season of Coach Finn’s Wild Horse Lacrosse along with his Saddleback Starz program. Coaching with Finn at that time was his Long Island childhood friend Nick Tintle. In 2013, with Coach Finn’s departure to be the head coach at Beckman and run his own Wild Horse youth program, Nick took over coaching the boys’ U15 SoCal team pushing them harder than ever before. “Those two guys (Finn and Tintle) were responsible for advancing the level of play and I am very grateful to them as I’m sure all the parents were as well” Gerbashagen recalled. As the boys improved their skills they ventured out to play for premier club teams like OC Kings, Brady’s Bunch, RC Starz, and West Coast Starz. In fact, if you ask the boys to name the various teams they have played for, the team names rattled off and the jerseys they’ve amassed would astonish you. As the boys improved their skills they ventured out to play for premier club teams like OC Kings, Brady’s Bunch, RC Starz, and West Coast Starz. In fact, if you ask the boys to name the various teams they have played for, the team names rattled off and the jerseys they’ve amassed would astonish you. When the boys are asked to reflect on what they remember most about their days playing youth lacrosse, they admit it is hard to think of just one memory. You hear about the big games they’ve won. Buchman remembers winning the mini Olympian Starz Championship in a Braveheart finale in 2010. Harrington and Blethen share the thrill of playing for Wild Horse in 2012 beating rival OC Crush in The Battle of LA U13 Championship. 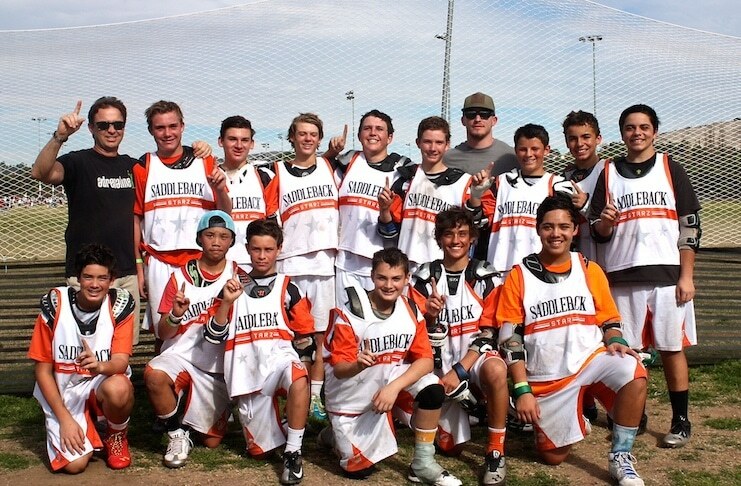 As 8th graders playing for the Saddleback Starz, Kelly Petro and Justin Burk remember being down in the 2nd half of the 2014 LXM/ATS U15 Championship game, scoring three unanswered goals and getting the win. Some memories incite groans like Gerbershagen, Ury, and Toohey’s tales of Coach Nick making them run endless meat grinders. Buchman reflects on how he started playing lacrosse as a goalie before switching to middie. He played goalie for 4 years before playing middie for his middle school. One day, he handed middie Petro his goalie gear, they switched positions and the rest is history. Colby Fojas remembers having to play defense in a game because the team was short on players…he hasn’t played any other position since. Even the origin of the Garden Gnomes team name brings a smile. Gavin’s little brother, Connor, jokingly called Toohey a Garden Gnome. It became a running joke and inevitably their team name. Ultimately, they unanimously echo the thoughts of Huerta, Payne, and Kauo that traveling to lacrosse tournaments and building lasting friendships is what they will remember most. Brotherhood. Fast forward to 2017. Attending different high schools, they now face each other as opponents, often rivals. But brotherhood takes precedence with hugs, fist bumps, and smiles shared as they meet on the turf. “The pity of it all is that our guys, once entering high school were split up and went to four different schools,” Gerbashagen said. “I would’ve loved to have seen our guys stay together and go to one high school, it’s fun to imagine how they would’ve done playing together.”. Who knew back in 2009 where lacrosse would take these young men. Maybe their coaches knew. In their three years of high school lacrosse these talented young men have already racked up an extensive list of accomplishments and accolades. Most of these athletes played on their varsity teams as freshman. There are scholar athletes with Justin Cheng being named a US Lacrosse Academic All American. Recently, both Cheng and Buchman played for the Under Armour All American West team. The Gnomes roster includes All Orange County and All League athletes including All League MVP’s. In addition, there are team captains, offensive and defensive players of the year, and varsity MVP’s. There are leading scorers and players with the most assists scored in season. There are two sport athletes juggling football and lacrosse schedules and time spent serving the community like Quinn Lewis who leaves on a mission trip to Guatemala after the tournament. These young men are looking forward to their senior year and their future beyond high school. Their parents and coaches look forward to watching them achieve their goals. Tintle still coaches several of the Gnomes at Tesoro High School. He will have them together one last time as a group when he coaches them in the Tribz Lacrosse Showcase on July 29 and 3. The Garden Gnomes may never appear on the same field in the same uniforms after this weekend but they will always be teammates. Below is a roster of The Garden Gnomes Team. 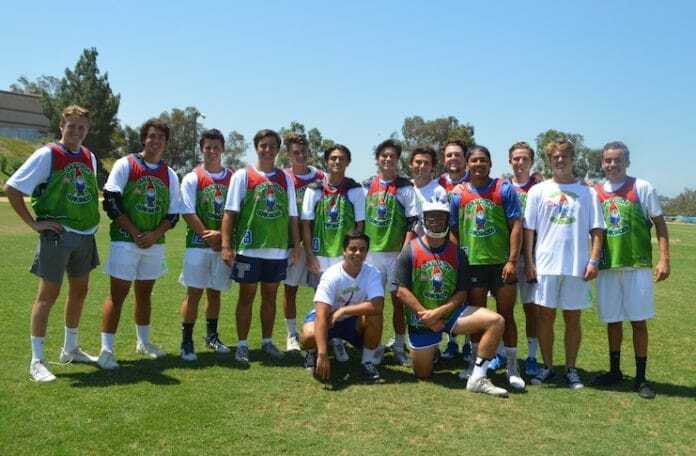 **A huge thank you goes out to the coaches and parents that made this team possible along with the support of Chapman University Coach Joel Schmitt-Kallas from Lacrosse Unlimited, the boys former coach from Saddleback Starz and OC Kings, who helped design and coordinate the Gnomes uniforms. **Cameron Brault remembers wearing bright green shoelaces during his youth lacrosse days in honor of the NEGU Foundation. As a way to give back to the community, The Garden Gnomes are teaming up with NEGU – The Jessie Rees Foundation and will be collecting donations for Joy Jars. Stop by any of the Garden Gnomes games at the Tribz Tournament July 29th and 30th and look for the collection boxes along the parent sidelines. Joy Jar suggestions can be found here.